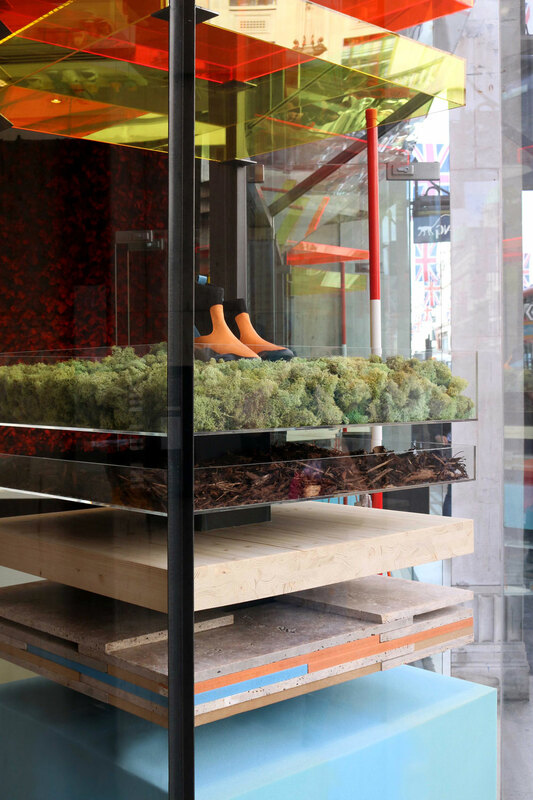 We were selected as one of the eight architectural practices to be part of the RIBA Regent Street Windows 2018. 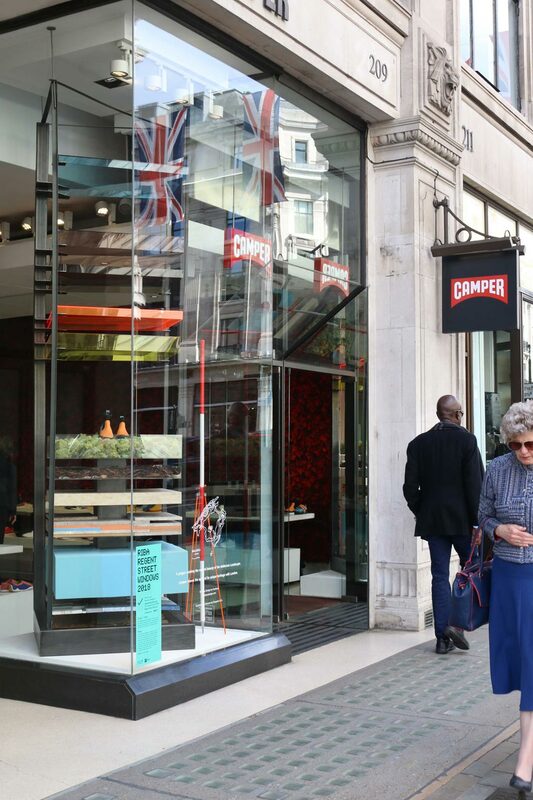 Working alongside Spanish shoe makers Camper, we designed and installed a temporary display for their shop window in Regent Street. We found inspiration in the company’s origin story, which began with the founder’s grandfather returning from London to Mallorca with the island’s first sewing machine. Our departure point was to consider what Camper might bring back to London in return. Aimed to display Camper’s new range of DUB shoes, the material palette was drawn by the colours and textures of the island’s landscape and inspired by Abdul Mati Klarwein’s Mallorca paintings. Representing a cross section of the island, the design brought to Regent Street Mallorca’s warmth and colour. An array of coloured acrylic filters was used to evoke the sunset of Mallorca and to manipulate the display lighting bathing the shoes in a Mediterranean light. 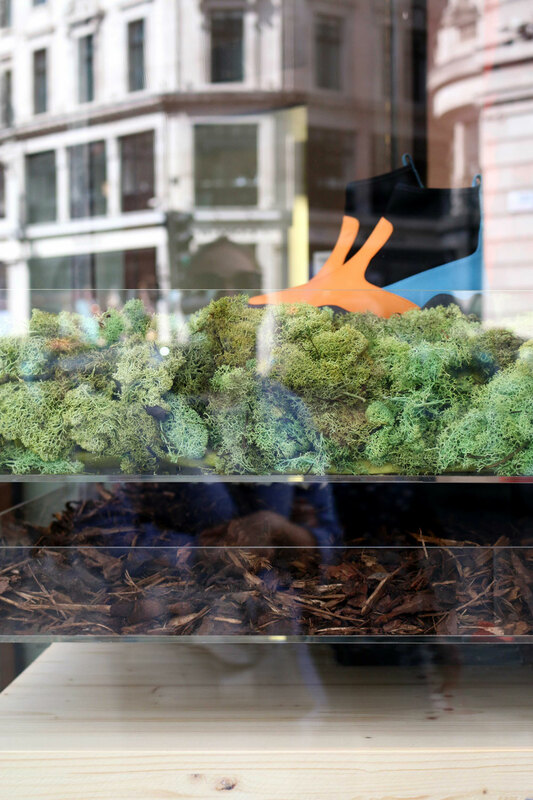 The shoes themselves sat atop a layered structure, inspired by geological core samples, with the materials chosen to respond to the vegetation and rock formations of Mallorca. Moss, pine bark and solid pine timber were used to reference Mallorca’s ecological landscape – the scent of these materials intended to provide a sensory allusion to the island. Slabs of travertine and terrazzo reference the geology of the Mediterranean, with the seascapes evoked using coloured sponge and sand. A ranging pole was left at the side of the display, in reference to the instruments used to survey and sample landscapes, suggesting the recent excavation and the arrival of the installation from Mallorca. Outline, Abdul Mati Klarwein, 1984. 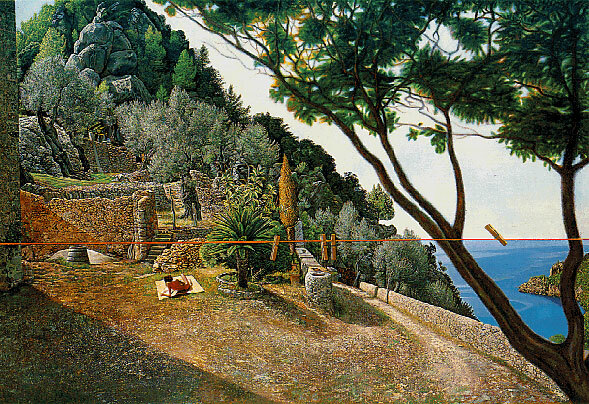 Concept sketch of Mallorca’s cross section.